Every day is a great day to highlight the accomplished professionals that make up our worldwide community of photographers. This weeks Behind the Lens series is focusing on Alyse, one of our San Francisco photographers. Her inside scoop and story is one for the books! 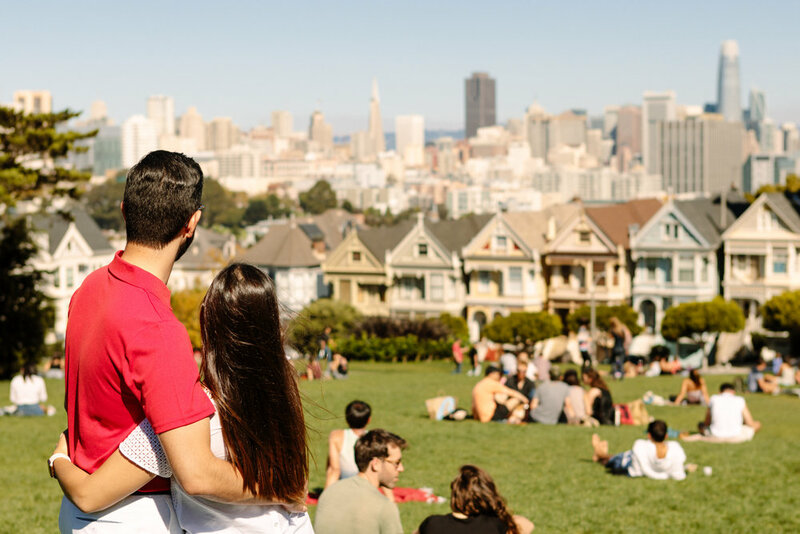 Read on for a local perspective on The City by the Bay and what led her there! What drove you to San Francisco? I first picked up a camera when I was in junior high, back in the 90s before digital. It was Christmas day, and I begged my dad to let me have a go with his Nikon. I remember wanting to capture and remember everything about that day, especially moments with my family. Preserving memories with family and friends first ignited my passion for photography. Good photography relies heavily on composition and lighting, but I believe that having an emotional connection to the photo is just as important, if not more. My most cherished photographs are the ones that conjure up happy memories with family and friends, regardless of how "technically good" the photo may be. With that being said, the easiest tip for beginners would be to take pictures when the light is best- about an hour before sunset to about 20 minutes after the sun has set (aka golden hour!). The best way to be in front of the lens is just by being yourself! Stay present where you are and with the people around you and allow the photographer to capture real moments. These are the photos you'll love- I promise! What are your top 3 favorite photo spots in San Francisco? Pier 7 / Embarcadero: I love walking along the embarcadero and pier 7. The embarcadero has palm trees 🌴, colorful streetcars going by, plus views of the Bay Bridge and downtown San Francisco that look especially amazing from the pier. North Beach (little Italy) and China Town: These neighborhoods are just next door to one another, and I like to explore them together. Both have a rich history and culture that can still be felt today. A walk through their streets feels like stepping back in time. Golden Gate Park: For nature lovers, I like walking through the many gardens in Golden Gate Park. The Japanese Tea Garden, the redwood grove, and Conservatory of Flowers are my absolute favorites and provide uniquely different but equally beautiful backdrops. Shoot My Travel has been such a fun and rewarding experience. It's given me the opportunity to meet wonderful people from all over the world and do the things I love most, explore San Francisco, and take pictures! Providing photography services that connect explorers to professional photographers from all around the world is a true honor. The art of good photography can capture so much in a split second. Memories, love, laughter, and the thrill of adventure can live forever through a photo. Each destination offers its own unique essence, as do the people Behind the Lens. Every unforgettable photography experience works to highlight the true beauty of the present moment, and how meaningful it really is to capture the moments worth looking back at for many years to come. There really is no better souvenir.